BMW X3 Pros and Cons | Page 1 of 1 | Why Not This Car? 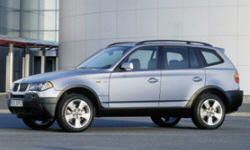 2004 BMW X3 good reliability, but some problems. Better than EPA mileage, 18 around town, 25 highway (65-70 mph). 20 average. I have records of every fill up. problems: twice had pollution control items repaired. Once failed state pollution inspection due to odd OBDII report, no check engine light error though. Dealer reprogrammed the computer to fix. I had nothing but problems with this car. it is an attractive little SUV, but for me .... thats it. I will never buy another BMW again. X3 is sporty SUV with excellent ride quality. Engineering is class leading 8 speed auto, 250hp, 9 inch NAV display etc. Great passing power on two lane roads. Modern design, proven technologies, well built. Precise, taut steering. Lack of body roll. It drives like it is on rails. The looks of the X3 are nice for a small SUV. I like the resemblance to the X5, which is tops in my opinion. Incredible power and smoothness, with good fuel economy. BMW makes a fantastic engine. After a long trip, a downshift in the driveway from 2nd to 1st was missed accompanied by slippage and loud noises. In test drive around the neighborhood it continued. Next morning was ok. Dealer unable to find any computer log of event. The handling is amazing. You forget you are driving a 4,000lb SUV. It handles better than many �sports cars� and instills a great sense of confidence. The inline six, combined with the 6 speed manual, provides smooth & quick acceleration (0-60mph, 6.9 sec)especially when pushed to its limits. Depending on driving habits you can achieve overall gas mileage of 22 mpg. solid handling. minimal body roll. precise cornering. avoids obstacles and potholes without fuss.